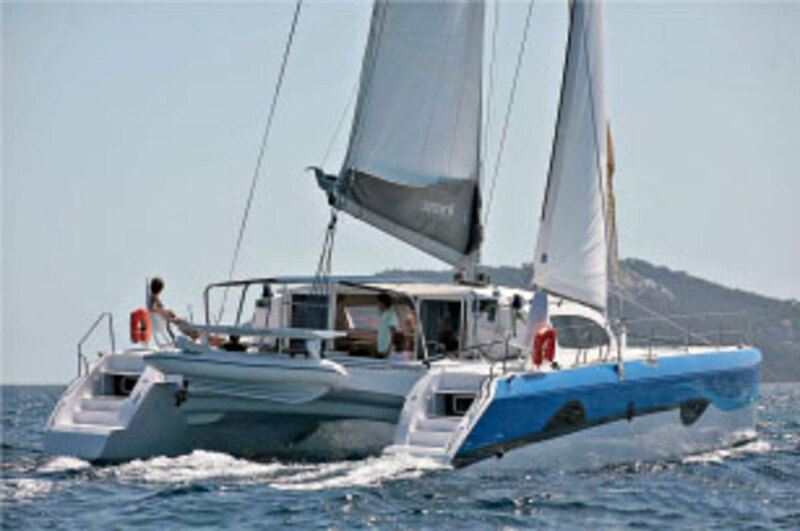 French builder Outremer is well known in Europe for its fast yet comfortable performance cruising catamarans. Its latest offering, the sleek Outremer 49, designed by Christophe Barreau, made quite a splash when first introduced across the Pond. 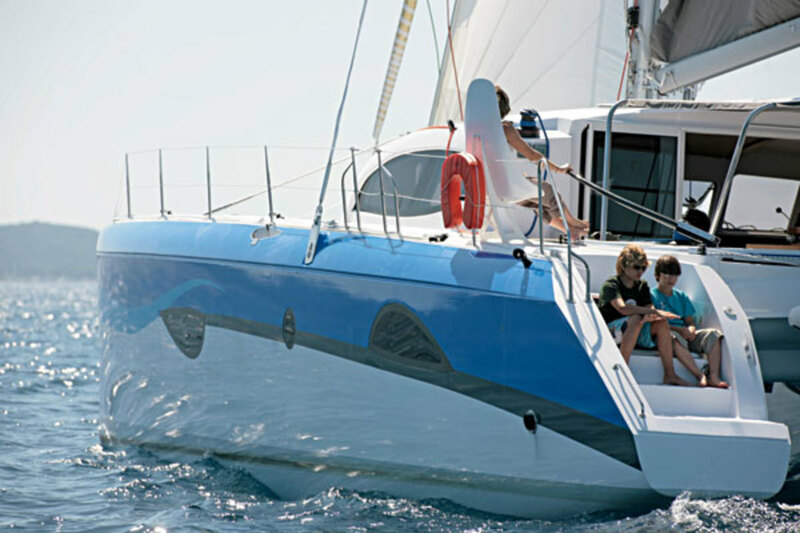 French builder Outremer is well known in Europe for its fast yet comfortable performance cruising catamarans. Its latest offering, the sleek Outremer 49, designed by Christophe Barreau, made quite a splash when first introduced across the Pond, and snapped up an award in 2010 for European Boat of the Year in the hotly contested multihulls category. With its distinctive looks, which include a high bridgedeck, low-profile cabinhouse and unique asymmetric mirror-image ports in the hull topsides, the Outremer is one modern cruising cat with lots of personality. I had a chance to sail one well-equipped example on a challenging fall delivery between Rhode Island and Maryland and came away very impressed. The boat’s construction is fairly conventional by performance-cat standards. South of the waterline the resin-infused hulls are solid fiberglass laminate; above they are cored with PVC foam. The deck is a resin-infused PVC/glass sandwich bonded and then laminated to the hulls by hand over its entire length to create an essential monocoque structure. The primary resin used is polyester, with vinylester in the skin coats and an NPG gelcoat for enhanced blister resistance. Structural reinforcements are glassed into the bilges, and all bulkheads are tabbed in place. In terms of its design, the Outremer 49 is true to its heritage. The hulls are relatively high and narrow, carrying daggerboards rather than keels to resist leeway, and there is little solid structure forward of the main crossbeam. The rig on our test boat featured a rotating carbon-fiber Lorima mast; a conventional fixed aluminum mast is also available. I found the deck and cockpit layout to be almost ideal, as is reflected in the fact that the boat won SAIL’s 2012 Best Boats award in this category. The most distinctive feature on our test boat was the optional tiller-steering system, which ties carbon-fiber tillers on each hull aft (complete with sculpted ergonomic carbon-fiber helm seats) into a conventional bulkhead-mounted steering wheel on the starboard side of the coachroof. The system is entirely unitary (the wheel turns the tillers and vice versa), but is amazingly free of friction. It is also exceedingly effective. When the boat is sailing well, you can enjoy the intimacy of steering it by hand with a tiller; when you need to make a lot, of course, changes quickly, or are monitoring an autopilot, you can sit comfortably behind the wheel. On our test boat, the only controls on the coachroof were for the rotating mast, the double-ended jib sheet, and the main halyard. Everything else is handled at two dedicated winch pedestals behind the two coachroof stations. One or two crew can manage things easily within the compact, but not cramped space. Meanwhile, there’s plenty of room aft for guests to relax without getting in the way. Shelter over the cockpit is restrained but effective. There’s a hard targa walkway under the boom, plus canvas wings to shade the table and cockpit seats. All steering stations have an unobstructed view of the rig. All deck surfaces, including the entire coachroof, are covered with effective antiskid. One knock against older Outremers was that the interior finish left something to be desired. 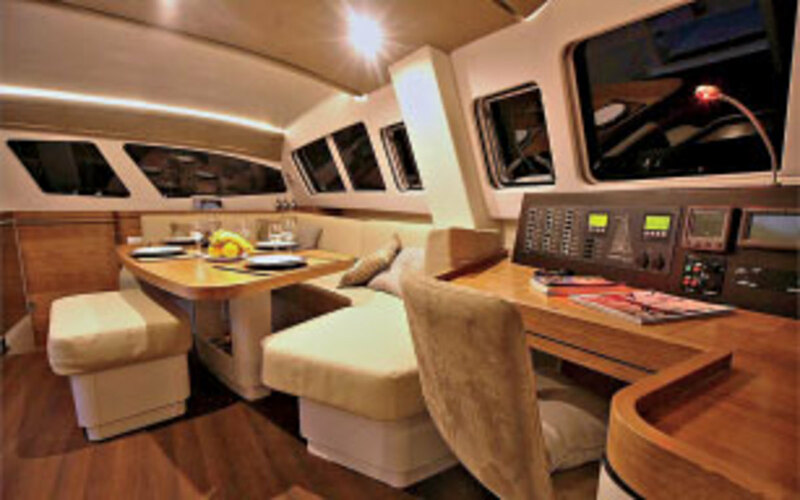 For this boat, however, the builder put renowned interior designer Franck Darnet in charge, and the results are admirable. The aesthetic is clean and elegant; finish quality is above average. Although space in the hulls is a bit cramped compared to more cruising-oriented cats—both because the hulls themselves are narrow, and because of the bulky daggerboard casings amidships—it is more than adequate. There’s plenty of room aft for a generous-sized double berth in either hull and space enough forward for a pair of slightly less generous doubles there as well. Three different standard layouts are available, one of which features three different single berths. Custom layouts are also an option. The layout of the bridgedeck saloon is fairly conventional, with the galley aft to starboard, right by the big sliding door that leads into the cockpit, and a large nav desk and a table with a long wraparound settee forward. I thought the range and oven in the galley were a bit small for a boat this size, but the fridge and freezer installation on our test boat was both fabulous and enormous. Our test boat boasted a big square-headed mainsail, and with this sail plus a screecher we maintained 8 to 9.5 knots of boatspeed on a close reach in flat water on Chesapeake Bay in a little less than 10 knots of apparent wind. Once the breeze piped up to 16 knots, we were doing better than 11 knots. Thanks to the daggerboards, the boat also did quite well sailing closehauled under the full main and self-tacking solent jib. Sailing into an apparent wind of 18 knots at an apparent angle of 25 degrees, we hit speeds in excess of 9 knots and had little trouble short-tacking up to Annapolis ahead of several other boats that were motoring straight in. Steering the boat under sail with the tillers was a real treat. It was easy to make the small adjustments necessary to keep the boat cooking in a groove with just one hand, while helm feel, for a cat, was superb. Making big course changes with the tiller was hard work, so when tacking or maneuvering under power we switched to the wheel. During the first part of our trip, we motorsailed south from Rhode Island into 15- to 30-knot headwinds. In flat water, with both engines running at 2,100 rpm, we maintained speeds over 9 knots; in steep head seas in open water, we made 6 to 8 knots, in spite of some severe hobby-horsing. Maneuverability at close quarters was very good, thanks to the twin engines in the hulls. This is a true performance cruising cat that is both fun to sail and has accommodations that allow a family to live aboard comfortably for indefinite periods of time. The deck and cockpit layout are exceptional, and the tiller steering is a great bonus. For a boat of this size and type, the price is also very reasonable. For more Outremer Catamarans, Click here.